Dermot O'Hare is Professor in the Chemistry Research Laboratory at the University of Oxford. His research group has a wide range of research interests. They all involve synthetic chemistry ranging from organometallic chemistry to the synthesis of new microporous solids. 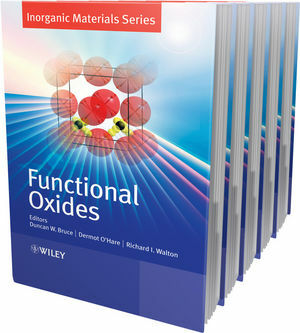 Duncan Bruce and Dermot O'Hare have edited several editions of Inorganic Materials published by John Wiley & Sons Ltd.
1 Metal-Based Quadratic Nonlinear Optical Materials (Olivier Maury and Hubert Le Bozec). 1.2 Basic Concepts of Second-Order Nonlinear Optics. 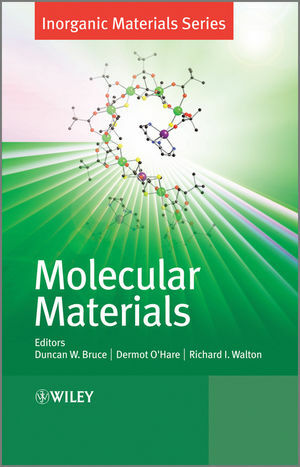 1.2.1 Introduction to Nonlinear Molecular Materials. 1.2.2 Molecular Engineering of Quadratic NLO Chromophores. 1.2.3 Experimental Measurements of Second-Order NLO Activities. 1.3.1 Metal Complexes as Donor Groups. 1.3.2 Metal Complexes as Acceptor Groups. 1.3.4 Metal Complexes as p-Conjugated Bridges. 1.4.1 Metal as Peripheral Donor (or Acceptor) Substituent. 1.4.3 Conformational Studies Using Second-Order NLO Activity Measurements. 1.5 Switching Optical Nonlinearities of Metal Complexes. 1.5.1 Redox Switching of Quadratic Nonlinearities. 1.5.2 Acid/Base Switching of Quadratic Nonlinearities. 1.5.3 Photoswitching of Quadratic Nonlinearities. 1.6 Towards the Design of Pre-Organised Materials. 1.6.1 Supramolecular Octupolar Self-Ordering Within Metallodendrimers. 1.6.2 Engineering of NLO-Active Crystals. 2 Physical Properties of Metallomesogens (Koen Binnemans). 2.3.2 Light Absorption and Colour. 2.5.1 Magnetic Anisotropy and Alignment in External Magnetic Fields. 3 Molecular Magnetic Materials (Neil Robertson and Gordon T. Yee). 3.2.2 The Curie and Curie–Weiss Laws. 3.3 The Van Vleck Equation. 3.3.1 Application of the Van Vleck Formula to an Isolated, Spin-Only Metal Complex. 3.3.2 Deviations from the Curie Law: Zero-Field Splitting. 3.4 Dimensionality of Magnetic Systems. 3.4.1 Lattice Dimensionality vs Single Ion Anisotropy. 3.4.2 Mean or Molecular Field Approximation in Any Dimension and Any Value of S.
3.5 Switchable and Hybrid Systems and Future Perspectives. 3.5.1 Bistable and Switchable Magnetic Materials. 4 Molecular Inorganic Conductors and Superconductors (Lydie Valade and Hisashi Tanaka). 4.2 Families of Molecular Conductors and Superconductors. 4.2.1 From Molecules to Conductors and Superconductors. 4.2.2 Organic Metals and Superconductors. 4.2.3 Transition Metal Complex-Based Conducting Systems. 4.3 Systems Based on Metal Bis-Dithiolene Complexes. 4.3.1 Synthesis of Metal Bis-Dithiolene Complexes. 4.3.2 Synthesis of Conductors and Superconductors Based on Metal Bis-Dithiolene Complexes. 4.3.3 Superconductors Based on [M(dmit)2] Complexes. 4.3.4 Conductors Based on Neutral Metal Bis-Dithiolene Complexes. 4.4 Towards the Application of Molecular Inorganic Conductors and Superconductors. 4.4.2 Films and Nanowires of Molecular Inorganic Conductors. 5 Molecular Nanomagnets (Richard E. P. Winpenny and Eric J. L. McInnes). 5.2 A Very Brief Introduction to Magnetochemistry. 5.3.6 Electron Paramagnetic Resonance (EPR) Spectroscopy. 5.3.7 Inelastic Neutron Scattering (INS). 5.3.8 Nuclear Magnetic Resonance (NMR) Spectroscopy. 5.4.1 Physics of Single Molecule Magnets. 5.4.2 Chemistry of Single Molecule Magnets. 5.5.4 Antiferromagnetic (AF) Rings and Chains. 5.5.6 High Symmetry Polyhedra and Spin Frustration. 2010 Tilden Prize Duncan Bruce has received this award from the Royal Academy of Chemistry. Click here to find out more.